As a non-member of the working world, the concept of a weekend is almost lost on me. Tuesday is Friday is Sunday. About the only differences between a Wednesday and a Saturday are the hours the stores are open and who is around to hang out with (oh, and Jeopardy is alway a rerun on Saturdays.) This weekend, however, felt different. Activities abounded. I'm aware of the fact that tomorrow in Monday. I almost even have a schedule to fall back into. But I digress. 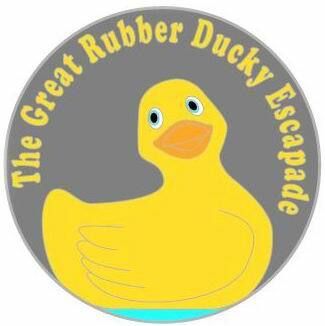 Saturday was the Great Rubber Ducky Escapade, a geocaching event with an elaborate premise, treasure hunt, and pot luck. While the event required more driving and less hiking than I like in my geocaching adventures, it was neat to see so many other geocachers. Oh, and the free cookies didn't hurt either. Sunday morning presented the opportunity to visit the Summit Park Grange for a fund raising pancake breakfast. The food was pretty alright, but the experience was top notch. Nothing makes you feel more appreciative of being young than spending a couple hours surrounded by people 40 years your elder. To wind up the weekend, I ended up at a place I've driven by a hundred times and always wanted to visit, but never have; the Old Edison Inn. Talk of the epic table shuffle boards have almost made me pull off the road on many passes. Tonight, those shuffle board tables were conquered! Along with shuffling, there was live music, great friends, and good pub food. I think I could really get used to this weekend thing. Heck yeah it was a good time! Thanks for reminding me to log that cache! i'd like to take this opportunity to make a plug for the fundraising dinner i'm hosting at the Eagles at 6 pm on March 10th (this Saturday). the cost is $8 and the menu is meatloaf, parboiled potatoes, gravy, salad, roll & apple crisp (or peach cobbler). proceeds go to the Anacortes Animal Relief Fund (helping low-income folks pay their vet bills for high cost surgeries and spay/neuter, which in turn curbs the number of homeless/unwanted animals in Anacortes). volunteers are needed, please, please, please! or if you'd just like to swing by for dinner, it would be great!! thanks so much & wren, i hope you are gonna be there too! there will be plenty of people 40 years your elder! I'm in if they're serving vegetarian loaf-style meat-analog. if you don't want the meat, you can have the potatoes, veggies, salad, roll and dessert!! What exactly IS the meatloaf made of? I'm just sayin, I HAVE noticed a decrease in the number of unwanted animals in Anacortes and an increase in the number of tasty meatloaves in town. Of course, it could be due to the hard work and excellent chefs of A.A.R.F. No, seriously now, this is a great cause for a longtime anacortes charity. Because I was taking a relatively new cacher out on the hunt, I tried to pick some fun caches. It turns out, I failed pretty miserably on that one. The first cache escaped our searching eyes, the second one was buried beneath a pile of beauty bark, and the third was in a park that was closed for some mysterious reason. Luckily, we bucked that trend with the 4th and 5th attempts of the day. We were quite pleased with ourselves. The last of the day was at Fort Warden State Park and offered this lovely view of the light house (left) as well as this one. Also at the park, I attempted to scare some explorers in the Kinzie Battery, but instead of being rewarded with screams of fright, I was met with a completely disinterested glare. Where are people's sense of fun these days? To soothe the ache of a mediocre day of caching (and scaring), we sought solace in one of the many fine eateries PT has to offer. After a spectacular lunch earlier at the Thai place (Thai food is good. Maybe I should go to Thailand. ), we upped the ante with pizza. It served as the perfect solace for me while some found solace elsewhere. Thanks for the good time! I look forward to the next geocache day with you...as long as you pick better caches. ;) BTW- I always find solace in beer- is there another way? Atta boy Wren! Scaring at the old forts is definitely where it's at. Although, hollering "Hey Kid..." apparently doesn't scare people as much as it amuses some others... Man, the Summer scaring sessions were glorious. Also, would the Sarah person you cached with be my former Clearidge neighbor, per chance? She definitely has the right idea about beer, that much is clear. It is I, Saxtor! Dear ex-Clearidge neighbor. I am happy to hear you, too, enjoy the brew! How's the old neighborhood? Hmmm. The same Sarah who smashed my papa's finger in his locker in 10th grade and then brought him brownies because she felt bad? Man, you'd think a guy who punctured his lung and takes explosions head-on for a living would be a little tougher about the locker thing. Max, you might want to start looking to your mom for general 'manliness' training.